Prominent singer of the country Selina Azad was enthralled audience at Bangladesh National Museum in the capital’s Shahbagh area on Friday. 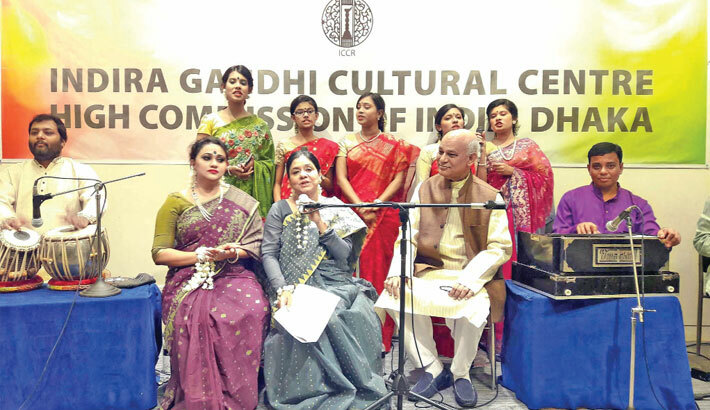 She performed at an evening of Modern Bangla songs organised by Indira Gandhi Cultural centre at Kobi Sufia Kamal Auditorium of the museum at 6.30PM on the day. In between, 5 children of Sangskriti Kendra presented two small pieces of songs in chorus. Selina Azad sang some of her hit film songs of yester years. The music of all the songs were given by her husband, eminent music maestro of Bangladesh Ustad Azad Rahman. The audience in the overfull Sufia Kamal auditorium of Bangladesh National Museum were spellbound by the melodious music and the sweet and soulful singing. Her voice had a special quality which touched their hearts. After a long period of thirty years, Selina Azad had first come on stage on invitation of IGCC. It was indeed a memorable moment for IGCC and the music lovers of Bangladesh. The singer accompanied by Gazi Abdul Hakim on Flute, Ruptanu Das Sharma on Keyboard, Chandan Dutta on Tabla 1, Gautam Sarkar on Tabla 2, Monowar Hossain Tutul on Guitar, Bidyut Roy on Octopad, Ratan Chandra Majumder on Harmonium and Moushumi Barua on Anchor. Selina Azad is a singer of modern Bangla songs, a teacher of music and General Secretary of Sangskriti Kendra (Centre for Education, Creative and Performing Arts), which was established in 1990 in Dhaka by eminent music maestro Ustad Azad Rahman. Born in a culturally oriented family, Selina Azad was inspired in music by her parents in childhood. She began her education in music from Ustad PC Gomez. Afterwards, she took further training from eminent musicians – Classical Vocalist Ustad Ful Mohammad and Nazrul Singers Janab Sohrab Hossain and Shri Sudhin Das. Selina Azad is a Special Grade artiste of Bangladesh Betar and BTV. In 1967, she started participating as a child singer in children’s programme in BTV. Later she earned great fame as a playback singer in the films ‘Masud Rana’, ‘Dasyu Banhur’, ‘Khokan Sona’, ‘Mayar Badhon’ etc. As Selina Azad’s songs were great hits, even nowadays her songs are regularly sung by eminent singers in various TV channels. Selina Azad is wife of Ustad Azad Rahman, eminent music maestro of Bangladesh, who is a great music composer and also the pioneer of Bangla Kheyal in Bangladesh.